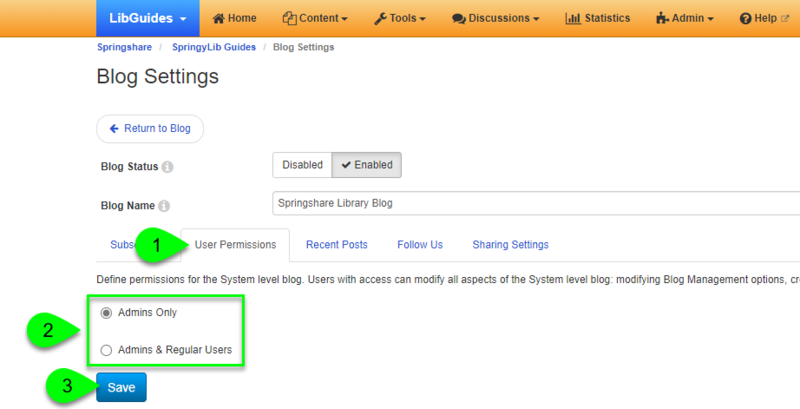 By default, only Admin users can manage the system blog settings, create posts, and edit or delete existing posts. However, by adjusting the blog's User Permissions, you can extend these options to Regular users, as well. Click on the User Permissions tab. Select the desired permission option. Admins Only: when selected, only Admin users can customize the blog options, create new posts, and edit/delete existing posts. Admins & Regular Users: when selected, this will also allow Regular users to customize the blog options, create new posts, and edit/delete existing posts. Users who do not have permission to modify the system blog will still be able to add comments to posts.